Sting | News | Sting: The Best Of 25 Years (Limited Edition Vinyl and 2-CD US Import) Now Available in the Sting store! Purchase the limited edition vinyl and 2-CD import versions of The Best Of 25 Years in the Sting store! LIMITED EDITION VINYL: This album includes No. 1 hits "If You Love Somebody Set Them Free" and "All This Time," Grammy® winners "If I Ever Lose My Faith In You" and "Whenever I Say Your Name" featuring Mary J. Blige, a new mix of "Never Coming Home," as well as previously unreleased live recordings (full track listing included below). 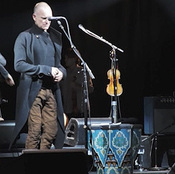 IMPORT TO US: Featuring 31 remastered tracks, including several remixes and live recordings, selections for this compilation represent a diverse cross section of Sting's enduring solo career. Highlights include the No. 1 hits "If You Love Somebody Set Them Free" and "All This Time," as well as Grammy® winners "If I Ever Lose My Faith In You" and "Whenever I Say Your Name" featuring Mary J. Blige. The CDs also include a new mix of "Never Coming Home" as well as previously unreleased live versions of "Message In A Bottle", "Demolition Man" and "Heavy Cloud No Rain" (full track listing included below). Video Clip: The band gets ready for the 2012 Tour. Are you going to any of the shows? Remember that if you have any photographs, ticket stubs or images from any concerts you have been too you can add them to the huge but ever expanding tour archive. Members can post their content directly or alternatively you can email material to daveandwendy@sting.com for addition to the site. Please share your experiences!